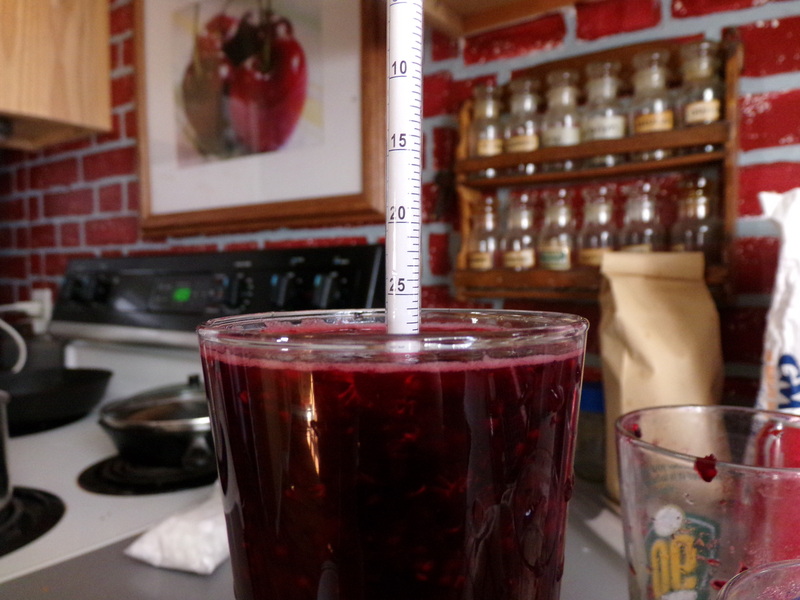 Half the reason I pick so very many berries is that I love blackberry wine. I don’t even bother with preserves- I can get excellent preserves at the Dane County Farmer’s Market with far less muss and fuss. 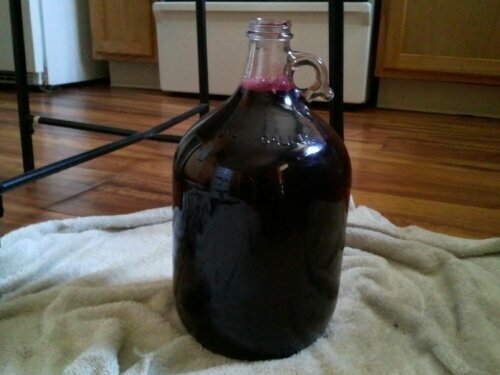 What’s infinitely more difficult to find is blackberry wine. However, the recipe I used last year is no more. So, I did some searching, and found another. 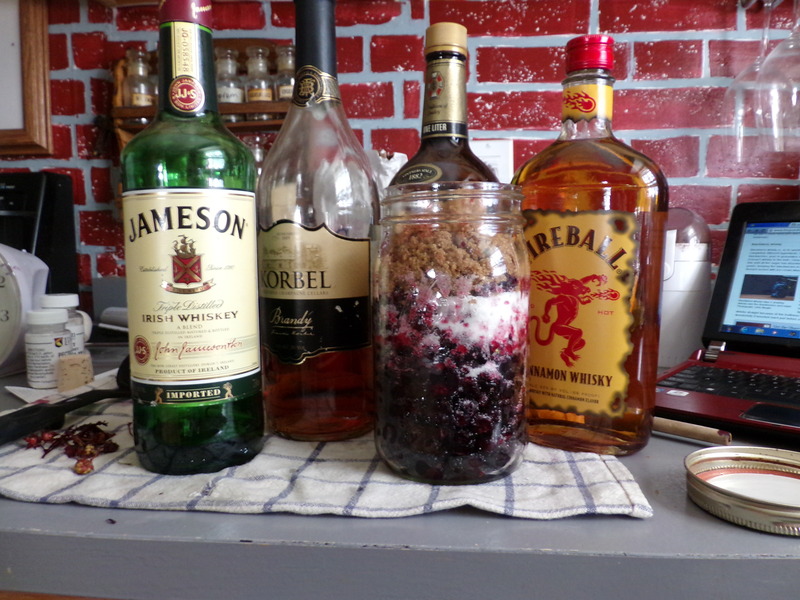 This one intrigued me with the additional recipe for blackberry whisky. So I made both, although I blended last year’s technique with this recipe’s amounts. 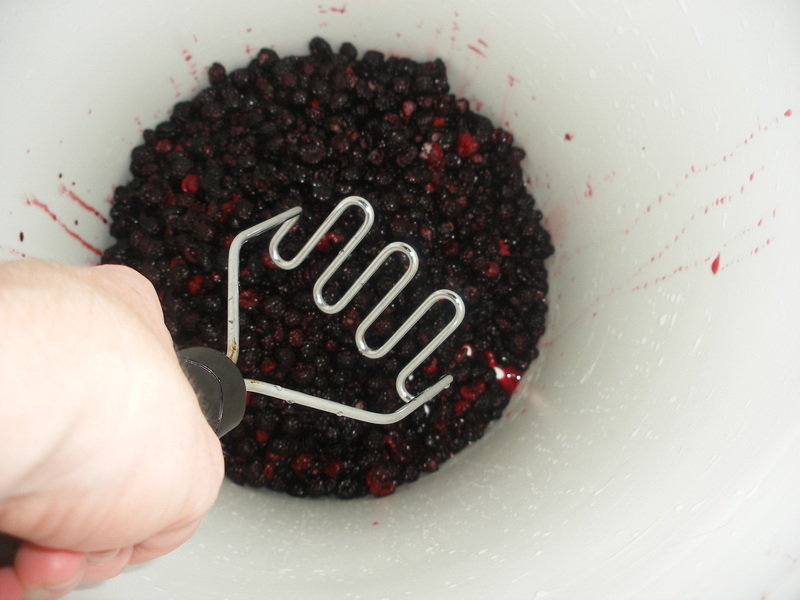 I was worried how the boiling water would affect the flavor of the berries. 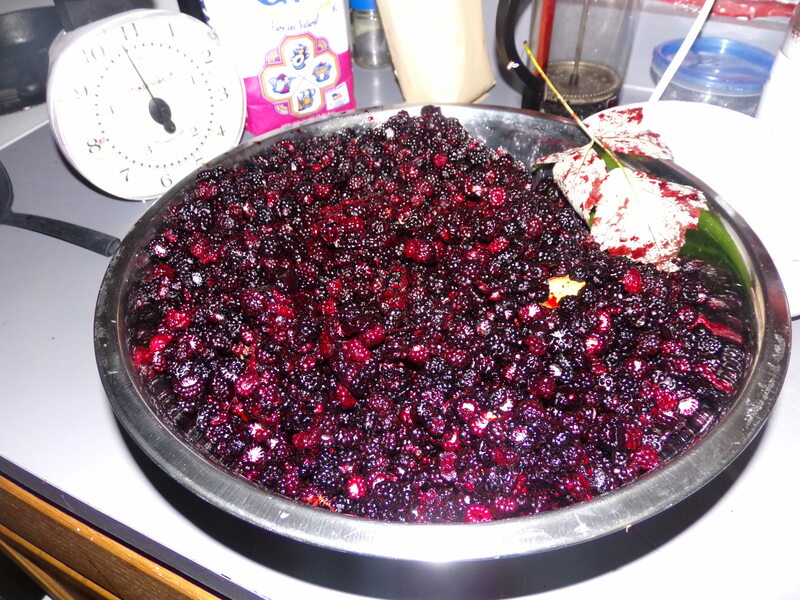 Ten pounds of berries in one large bowl. I was also low on whisky, so this is more of a blended brandy, with a dash of Fireball and Jameson. Mostly Korbel. Brown sugar syrup this time around, just for fun. The brandy will sit for up to a year, if I can wait that long. It’s on top of the fridge, so I hopefully forget about it, like everything else up there. 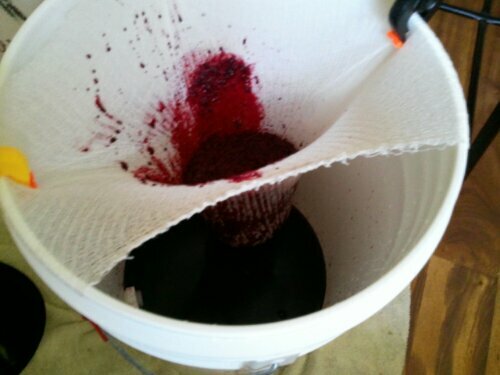 The wine pulp will sit for a week or two before I strain it off into a carboy for secondary fermentation. It’s nowhere near as hot this year as it was last summer- we’re actually supposed to drop from our current high of 82 (as I write on Sunday) to the 70s all week. I assume that will affect fermentation quite a bit. I’d been checking on my homebrew off and on for the last couple weeks. 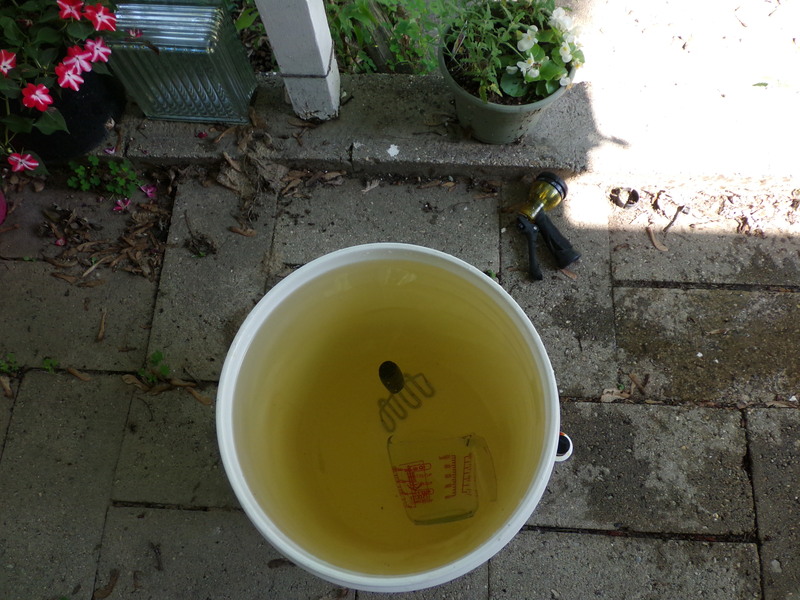 It had been stubbornly bubbling along, until sometime around Tuesday. I checked in on it again, and there were finally no bubbles. 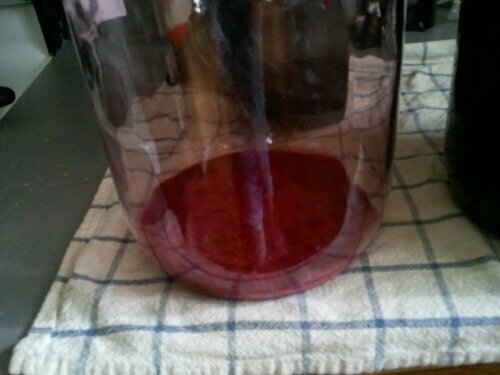 I decided to give it a few days, to make absolutely certain fermentation had stopped, but also until I had a day off. By now you know the drill. So, sanitize everything you plan to use, etc, etc. 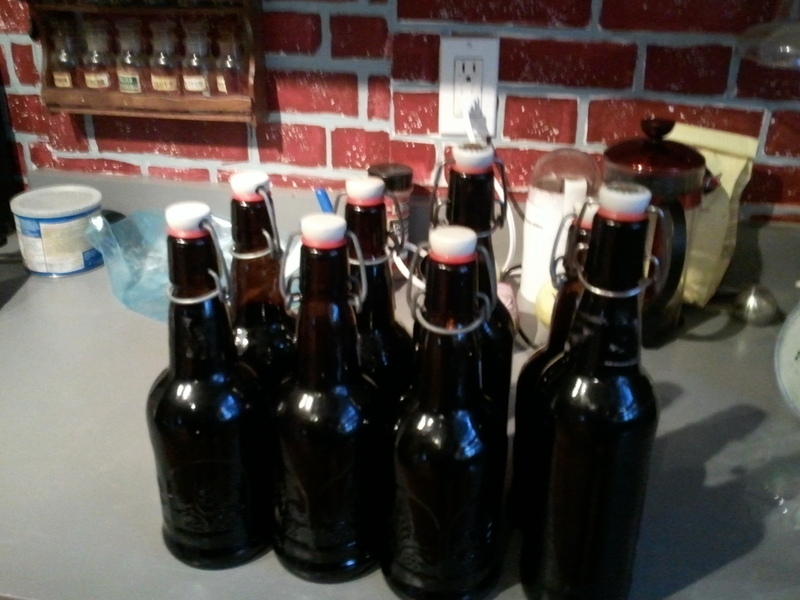 Since I’m carbonating this stuff, I opted to use eight 16 ounce swing top bottles. 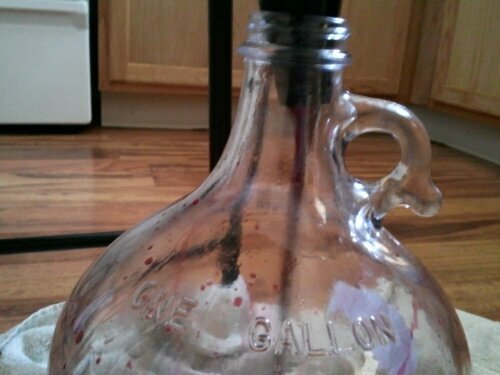 Had I just carbonated it in another gallon jug, I was concerned it would go flat, because I definitely can’t drink that much wine that fast. So. once they had been sanitized, I added the priming sugar tablets. I used four, which according to the package, would have produced medium carbonation in a 12 ounce bottle. Here it should be light-medium. With that done, it was time to siphon. 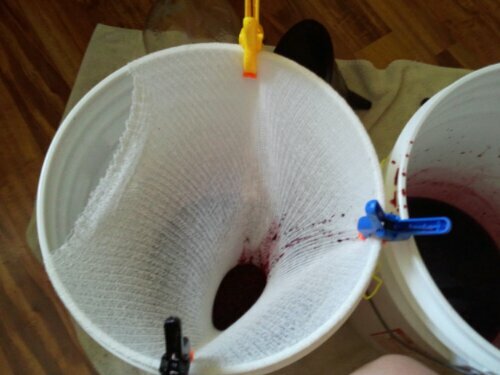 I got yet another healthy tasting of my wine doing this, and it’s good. On the strong side, too. 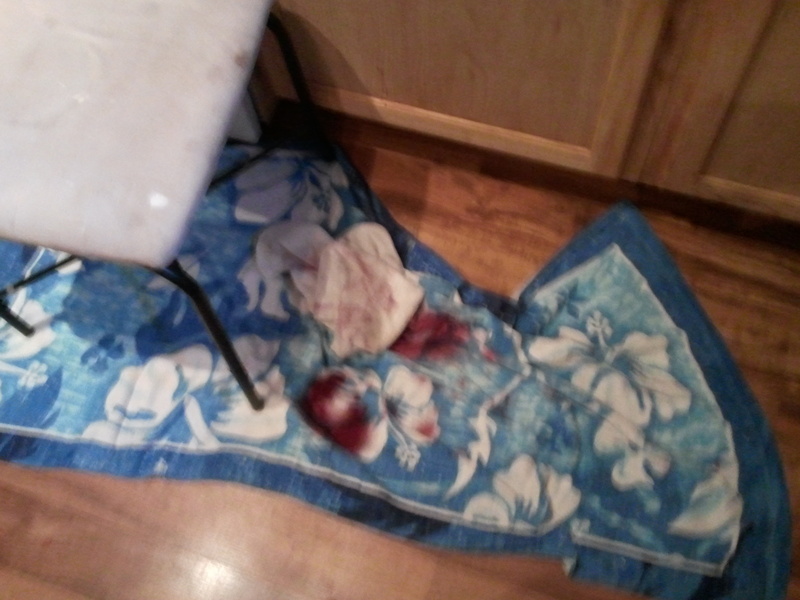 I also stained my leg and the lower kitchen cabinets. And two towels. So, once they were filled, I wiped down the mouth of the bottle and clamped the swing top shut. 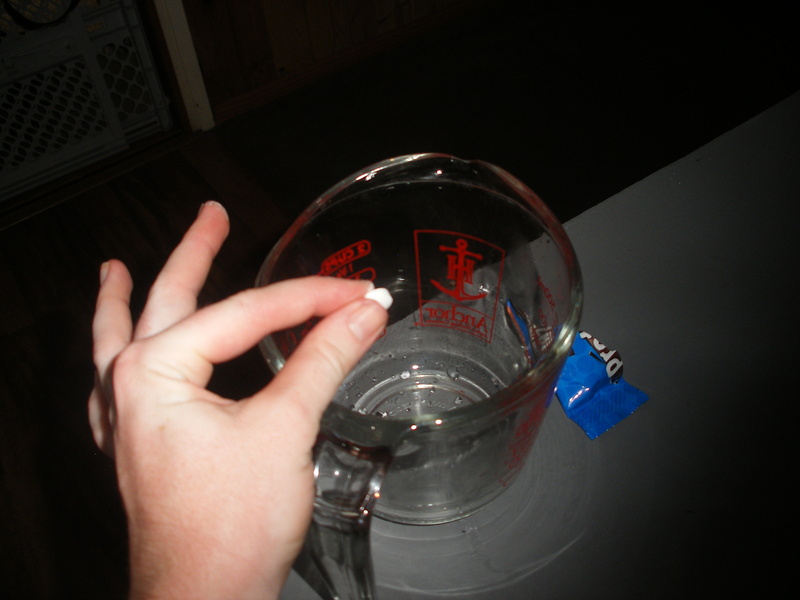 I swished each bottle a little bit to get the sugar tablets dissolved a bit more easily. 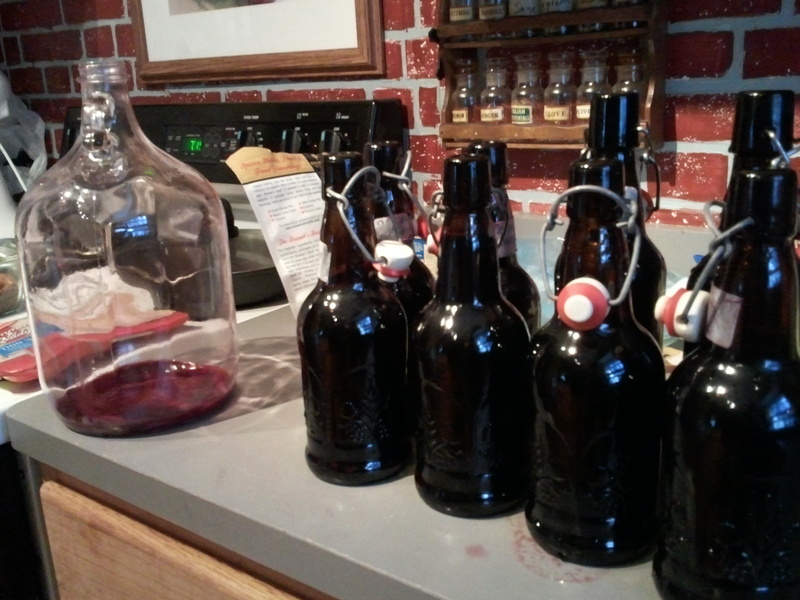 Not-yet-sealed bottles and the sediment in the jug. 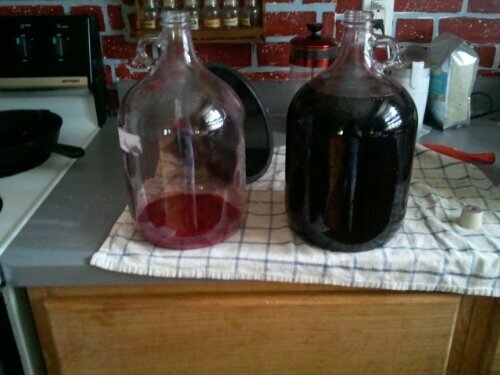 It should take two to three weeks for them to carbonate properly. And each bottle should be roughly 2 glasses of wine. Once I get a chance to drink it, I can report back on its potency, since I wasn’t able to get specific gravity measures before I fermented it. That taste I got tonight was a pretty strong one, though. Racking when brewing refers to the process of siphoning partially-fermented fluid off of the sediment left behind by yeast as they complete their life cycle. 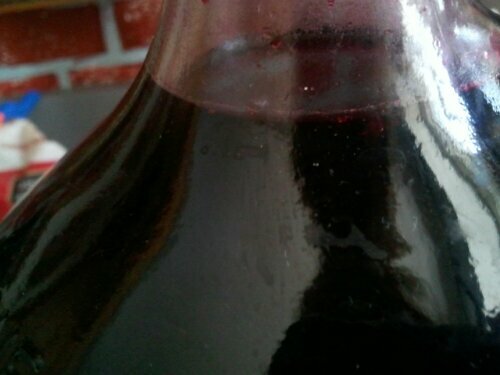 This sediment is usually pretty bitter and smelly- not things you want in your wine (or whatever). So, I did that today, ten days after straining it. 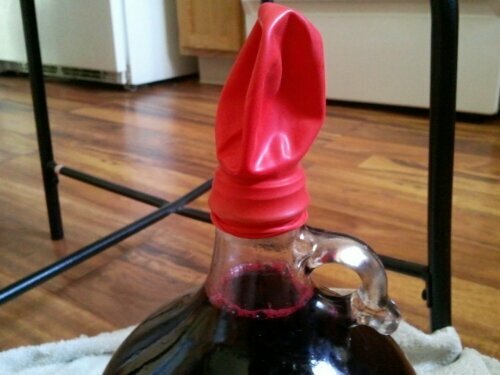 Fermentation had slowed considerably, and I had a mostly fully inflated balloon. So, more sanitizing and set up, then I was good to go. So, getting that siphon going proved to be a challenge. 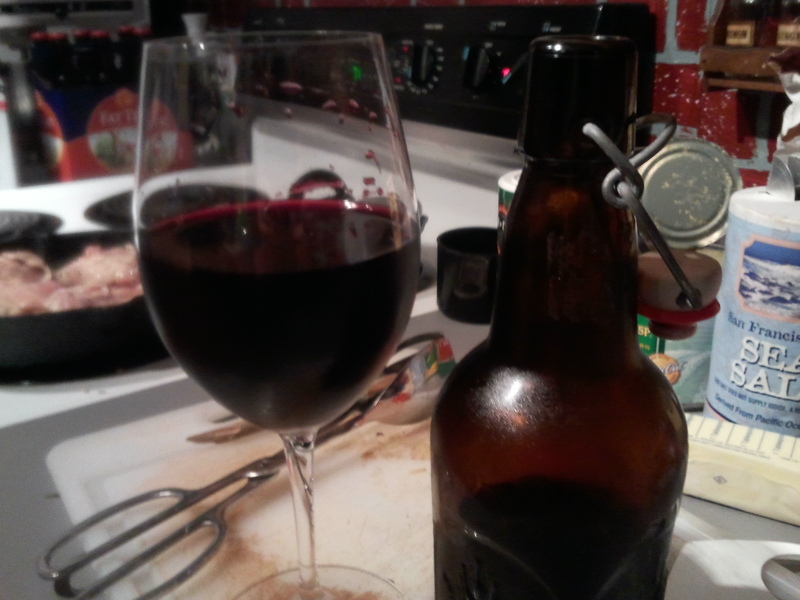 But the good news is that even for being quite unfinished, my wine tastes pretty damn good. Pretty strong too! The rest of the process was simple- after the siphon was done, add some syrup and seal back up.I was right- there wasn’t room for a pint of syrup in there. I filled it back to the neck, though. 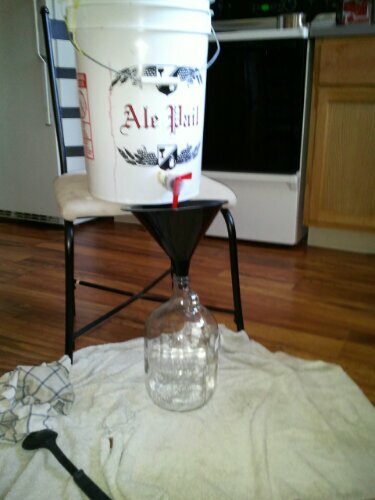 So, now it will sit until fermentation is done. Since I wasn’t able to add the entire pint of syrup, that may be shorter than planned. 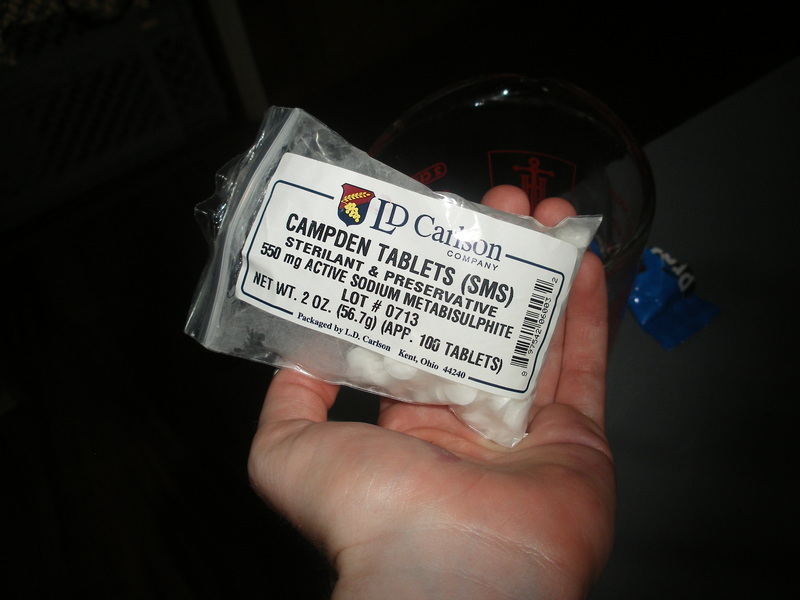 But- I’ll keep an eye on it, and then rack it a final time, then add conditioning tablets to carbonate it. 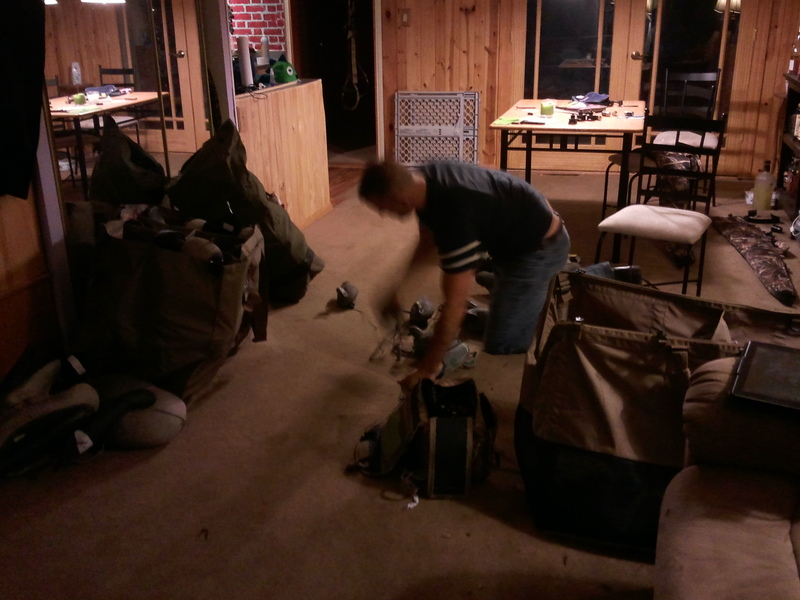 After figuring out what to do with the hide last weekend, we didn’t have much to do. A cold front had moved through, so we went from the mid-90s early in the week to the 80s, and the high Saturday was in the 60s. Overnight it dropped into the 40s. Totally out of place for mid July in this part of the country. Also why all our pictures from the weekend show us wearing sweatshirts. Saturday evening, we went fishing, after attending a short work-related function for Matt. 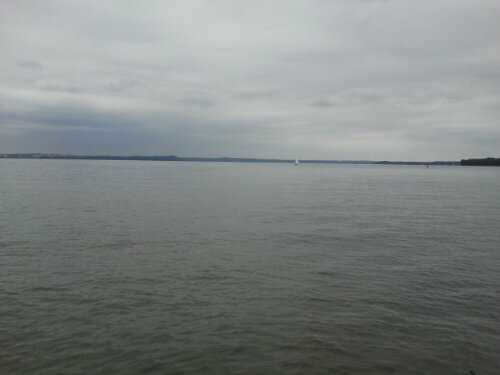 We didn’t catch a thing, and when we tried to bowfish after that, the water was too murky to see more than a few inches. We got spoiled with the water clarity last year- it was hot and dry, and though the levels were feet below normal, they were undisturbed and clear to the bottom. I did nearly catch a baby gar with my bare hand, though. Sunday evening I had to work, but on the way to the work function Saturday, we saw a yard sale with some pretty awesome stuff. They said they’d have more out the next morning. Sure enough, they did. Hand-forged antique sturgeon spears (we put in for our permits last night), antique fishing poles, a 150 pound cast iron cauldron, old tobacco pipes, axes, hatchets, antique woodworking tools, wooden longbows. 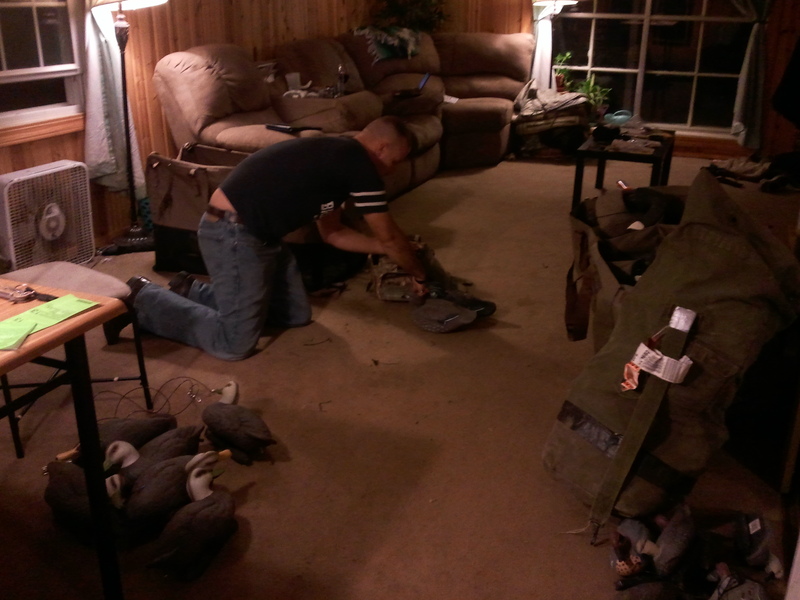 Basically, it was a small estate sale for an outdoors enthusiast. Do I even need to say we took some home with us? 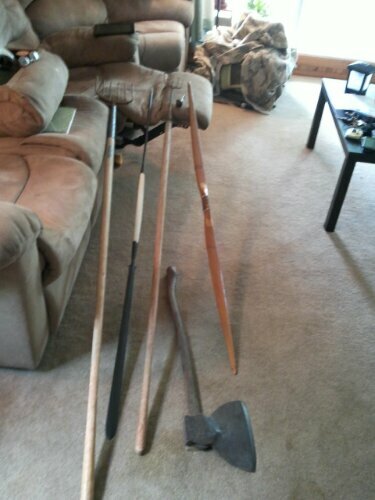 Two sturgeon spears, a Masai lion spear, a longbow, a broadhead axe, and a pipe. I hope my estate sale is half as intereting as this fellow’s was. That wrapped up our weekend. I went shore fishing on my own yesterday, but didn’t catch a damn thing. A kid next to me on the breakwater caught the biggest bluegill I’d ever seen. In the two hours I was out, I watched a fishing tournament get going, a scuba club head out, and four families with children let their kids chuck rocks into the water by my lines. I was less than thrilled. On the docket today is a run to one of the smaller Madison farmer’s markets (Saturday’s one on the Square is too early for me) and racking that wine. Last night, we put in for some permits. 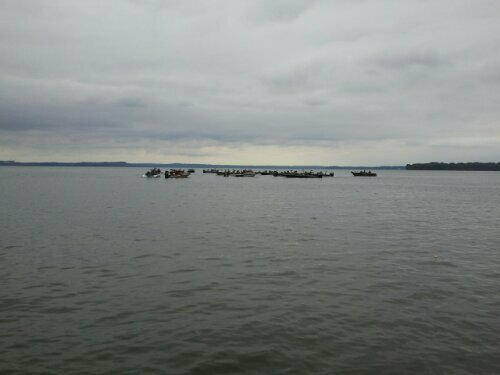 Applications for Fall turkey and Winter sturgeon spearing on Lake Winnebago were due by the 31st. 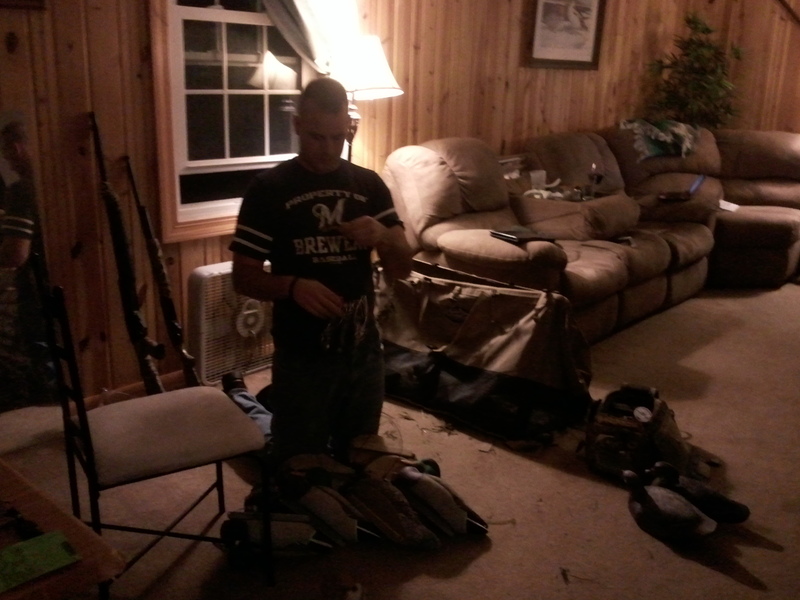 Matt also put in an application for wolf harvest, and discovered he has only 3 preference points for black bear. His home area requires a minimum of 9 points. The area just south of there requires 5, and just south of that requires three. Bear populations get correspondingly smaller the farther south one comes from Lake Superior. And even still, the area with any bear is two hours north of us here in Madison. Today’s my last day off before a new month starts, and I work all through the weekend. Since my boss was ignoring my un-availability on the weekends this past month and a half, my weekend availability for August goes from 8am-2pm Saturday and Sunday, so I can still do something with my life, rather than working 11 hour shifts and crashing. This weekend, however, has one of those 11 hour beasts of a shift, and I’m not too sure how much I’ll have to write about come Monday. At least some interesting seasons are getting closer, as is our replacement vacation. I am refusing to do any planning until I’m sure this one won’t be cancelled on us. I had originally intended to get this done yesterday, but two weeks of poor sleep during that heat wave caught up to me. Anyhow. It’s been just under a week since I started that wine. 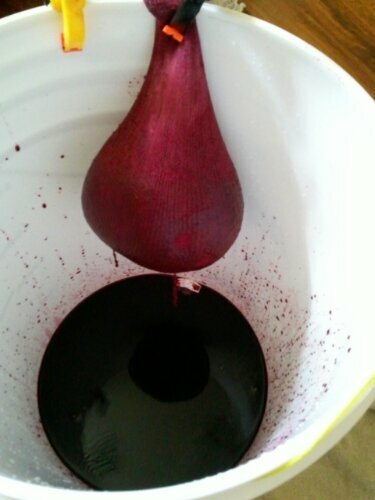 It was pretty damn hot for most of the time, so I cut the ferment on the pulp short. I’ve been checking the smell, and it definitely smells winey. Before that it was yeasty, which was good cause I’d worried I’d killed my yeast with Campden tabs. When the temp dropped yesterday, the smell stopped being as strong. When I got home from work this afternoon, I began to sanitize. 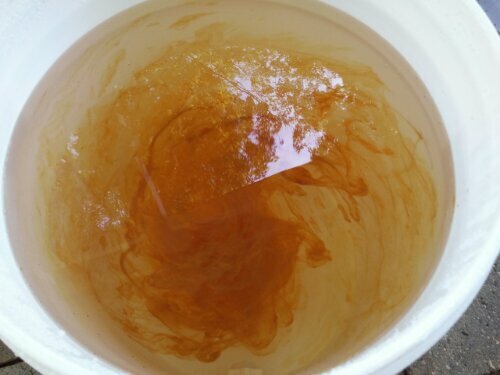 I cleaned out another bucket, in much the same state as the first, and re-sanitized a ladle, a spoon, a gallon jug, and my hands, since they would be doing the pressing. The recipe I’m following has me adding more syrup at this stage, and I had it cooling in a salted ice water bath. With everything clean, I was ready to strain out the pulp. 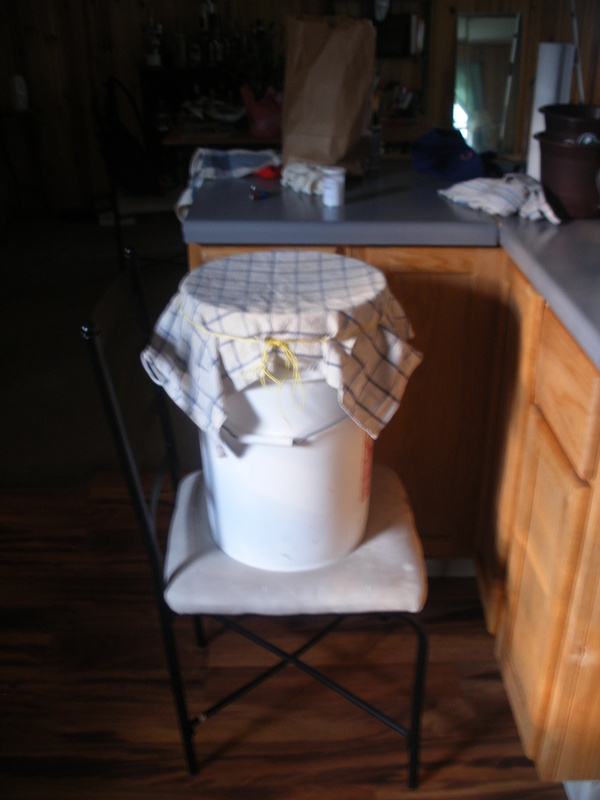 I ladled the mash into the muslin bag, and dumped the dregs in. I let it drip and drain under its own weight for a bit. Then I got in there and started squeezing and pressing by hand. My palms are still tinged slightly purple. 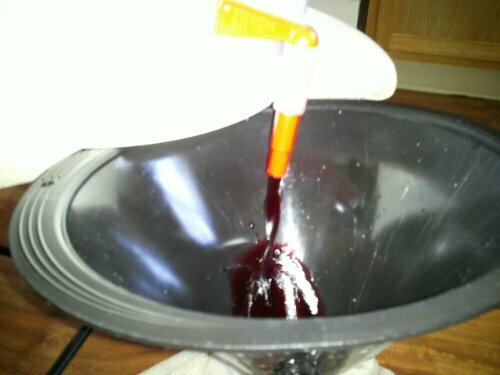 Once I got as much juice out of the pulp as I could, I added the cooled syrup and sloshed the mix around a bit. 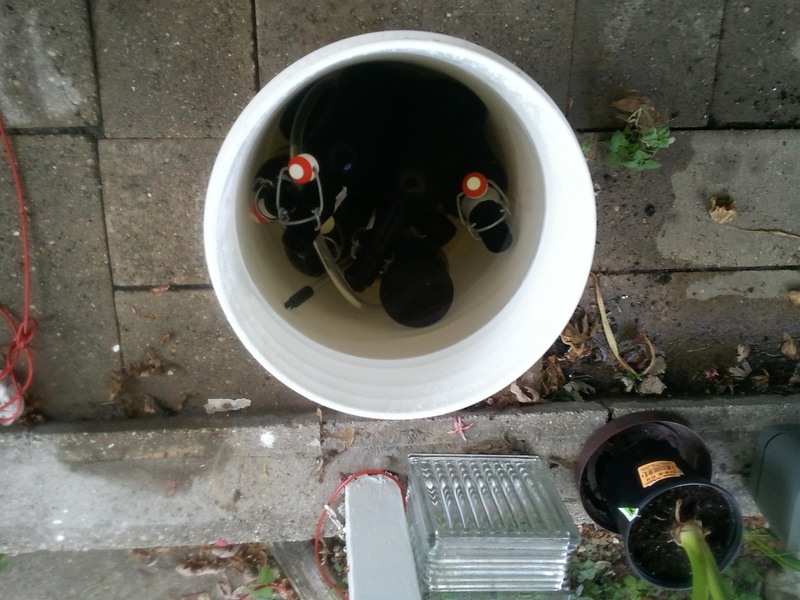 Then I positioned the jug and funnel under the spigot on this new bucket. And I let ‘er go. It’s quite full, more so than I expected from the recipe’s photos. It calls for one more syrup addition, but I won’t have room for that, and more syrup wouldn’t give it enough volume to fill two gallon jugs. 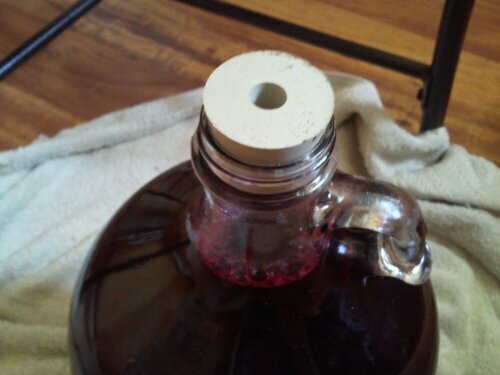 But, I fit the bottle with a rubber stopper meant for the airlock, and put a balloon over that. Now it will sit for ten days. If I didn’t murder the yeast, that balloon should slowly inflate with carbon dioxide as they consume the sugar and turn it into ethanol. 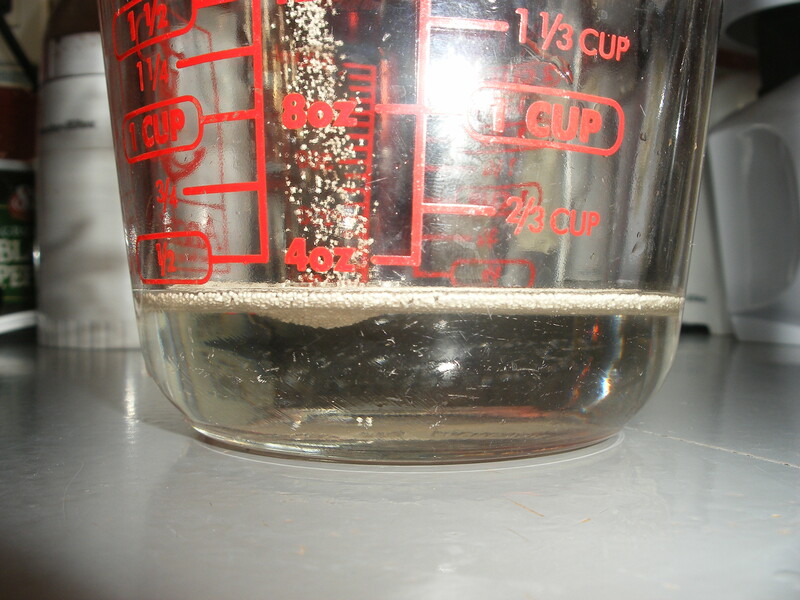 It will be racked two more times to rid it of sediment. 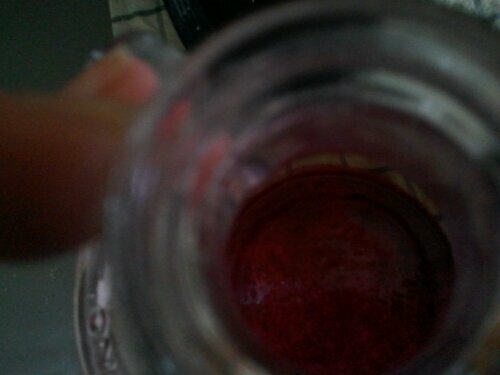 And sediment it will have- I know I squeezed plenty of seeds back into it. Since I can’t add more sugar syrup to it (unless racking it really reduces the volume), I’ll rack it once (after ten days) back into a clean jug, and then that third racking (once fermentation stops entirely, approximately a week or two later) will be the final one, and I’ll add the conditioning sugar to carbonate it before I cork it. 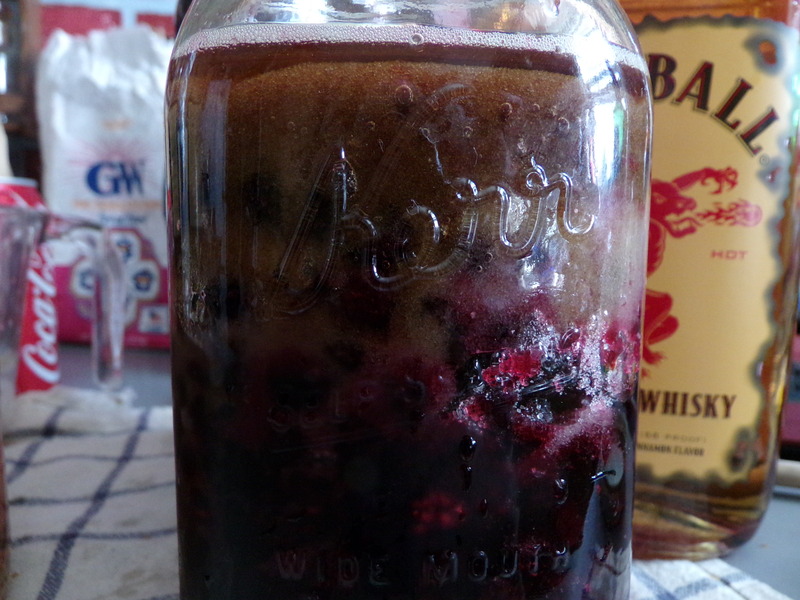 Wild Booze, Er, Food: Starting Blackberry Wine. Between the two of us, Matt and I have been homebrewing off and on for several years. He started with his college roommates before they moved to Madison, and I started with a former boyfriend and some mutual friends before I moved to Madison. I’m fairly certain they stuck to beer. 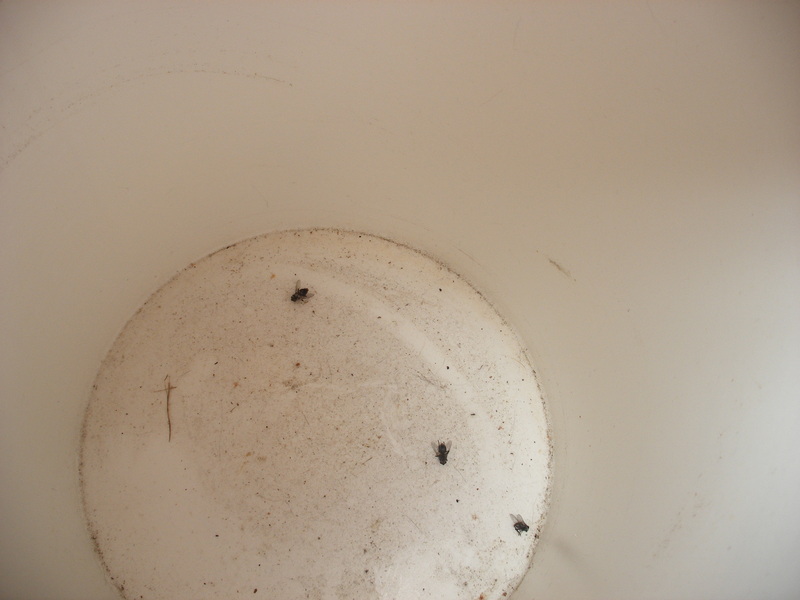 I had observed one batch of beer being made, and had made hard cider and mead from scratch. 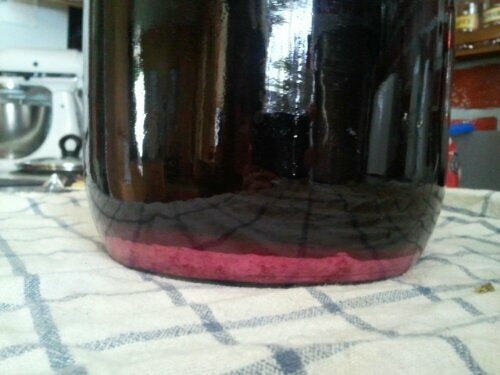 Not without mishaps- the hard cider was a bit watered down due to our flawed pressing method, and the mead exploded. 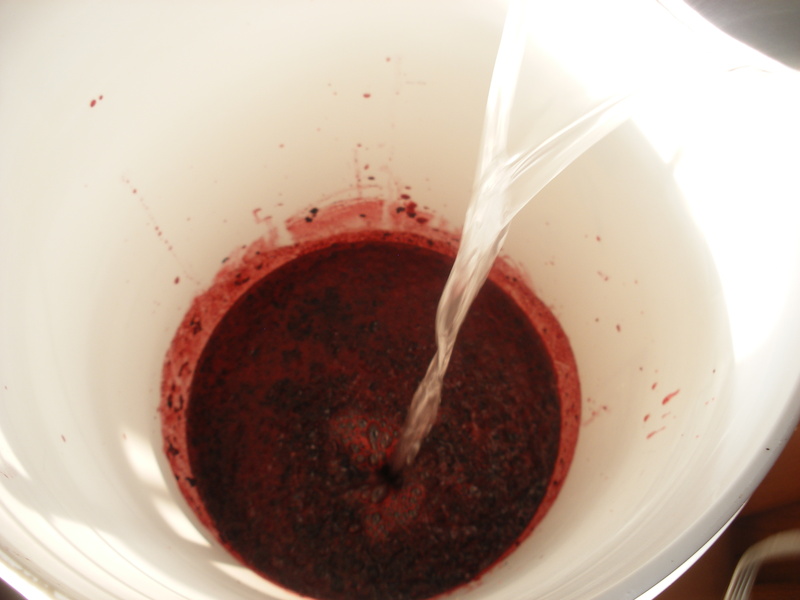 We carbonated it before it was finished fermenting the first time. Whoops. 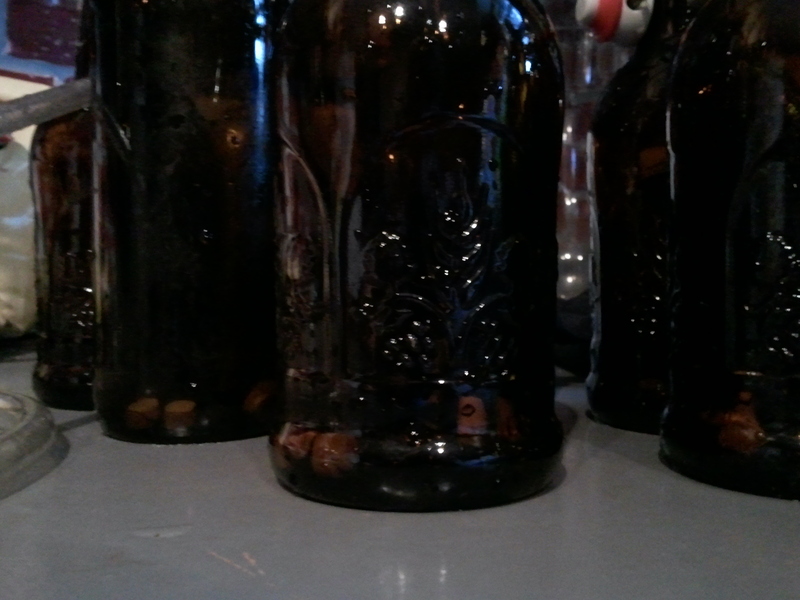 Matt and I together had made one batch of a Kölsch beer, and one batch of hard cider. 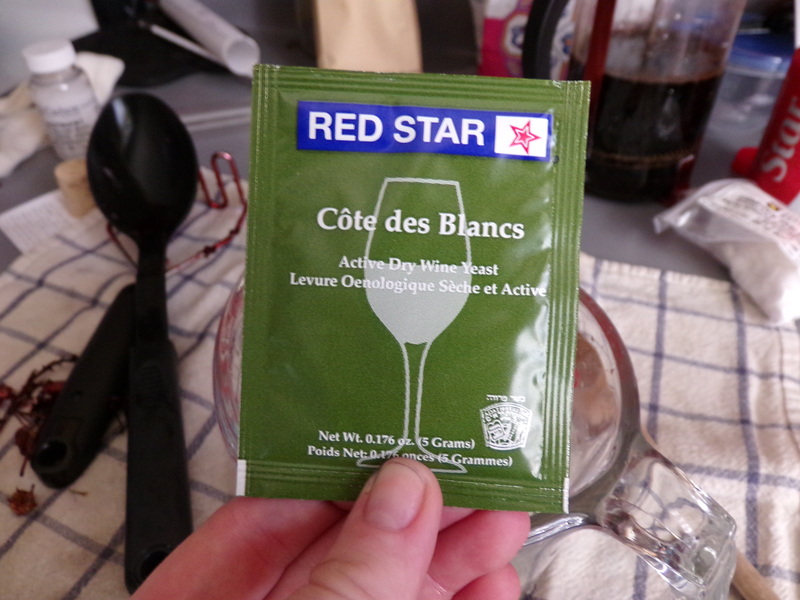 The beer was good, but the hard cider was too strong- I’m still hoping to turn it into apple cider vinegar. Anyhow. Today was my first time at Madison Brew N Grow’s new location. It’s smaller and over on Willy Street, which is pretty fitting, honestly. I picked up the essentials there. 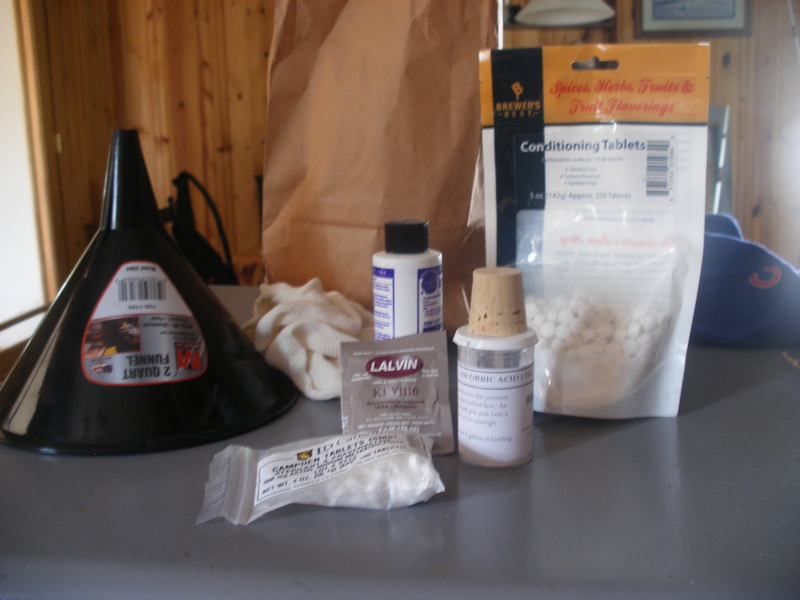 Yeast, sanitizer, ascorbic acid, Campden tabs, carbonating sugar tabs, a funnel, muslin straining bags, and a cork. The only thing I forgot was pectic enzyme, but there’s still time. Anyhow. Our last batch of beer was probably two years ago, and it showed. 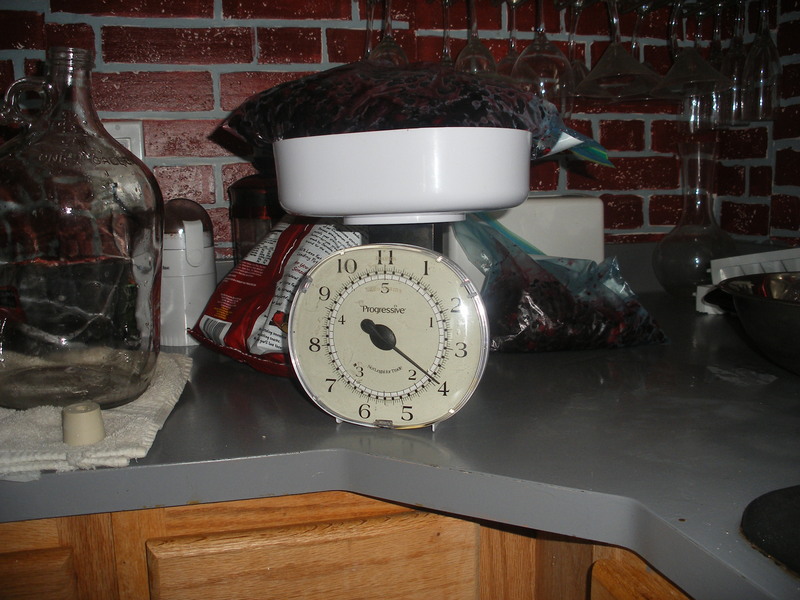 I think I even used this to house a batch of sangria after we brewed beer. It’s been a while. 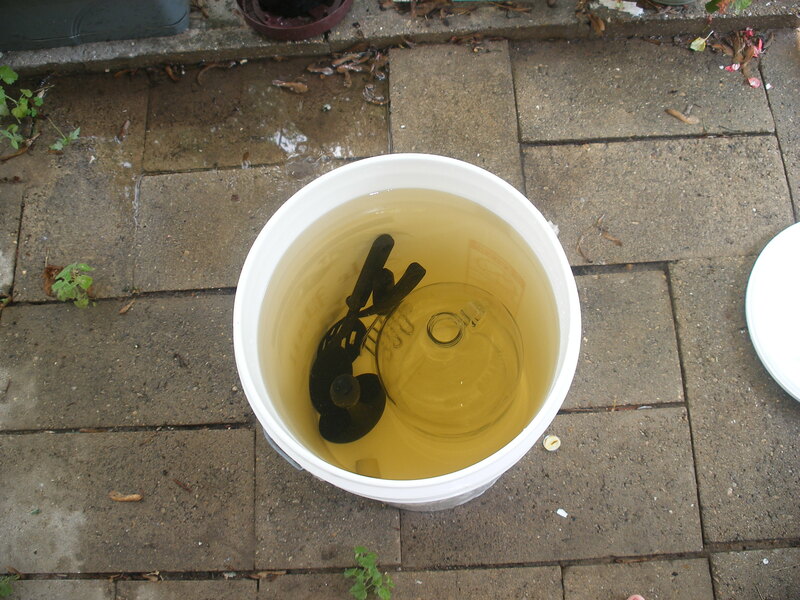 The sanitizer I bought works in cold water, so I did the whole deal out on the shaded front porch (seriously, it’s frickin hot, even more so in the sun) with the hose, after I washed the dirt and dead flies out with water and a tiny dab of dish soap. I made sure to rinse out the soap thoroughly. I’m no expert, but if you’re new to homebrewing, seriously, sanitize the everloving crap out of everything with actual sanitizer. It will save you much heartache. This isn’t like cooking where cleanliness can be half-assed because the heat will take care of it for you. 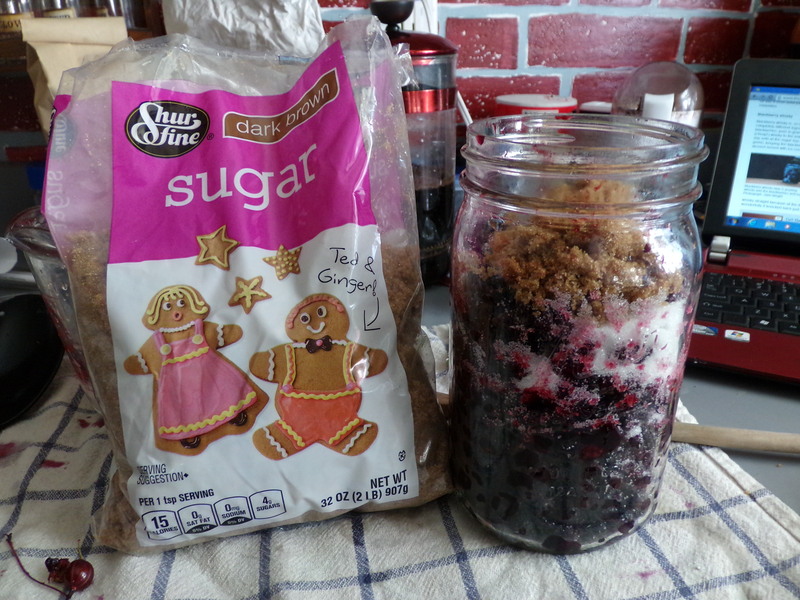 This stuff will basically sit at room temp in a not-always-airtight container for weeks. Wild yeast, bacteria, or mold could all cause it to go off. Every utensil, a carboy, and the bucket all at once, cause I don’t mess around. 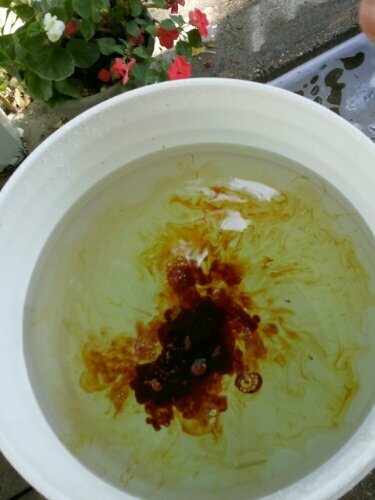 My bucket water is brownish, because the sani was iodine based. It smelled like hospital. 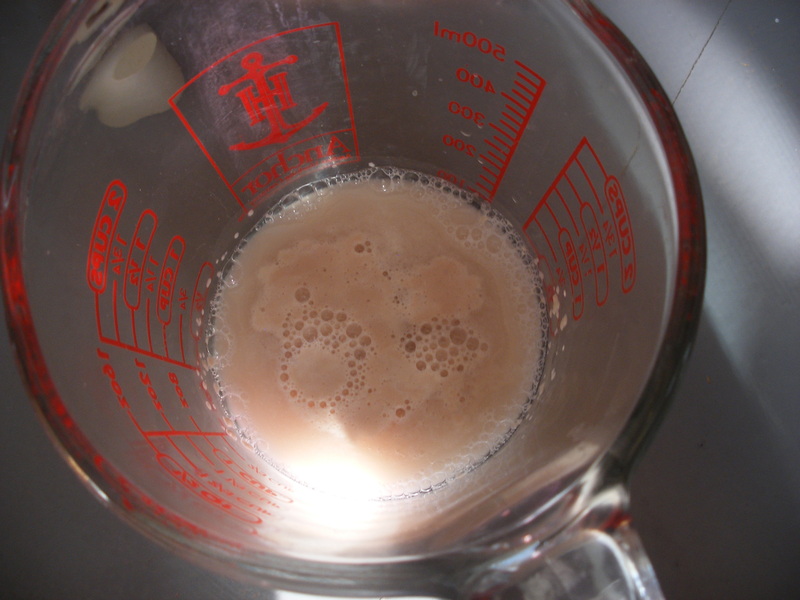 Once that was over, I started following this recipe, one of the very few I was able to track down online. I found a couple in some old books at my local Half Price Books today, but went with this instead. I won’t hash out all the measurements or whatever, because I followed it very closely. Mashed with my potato masher. Just one, then crushed, mixed with water. All mashed, with the quart of water. Time to wake up, little yeasts. 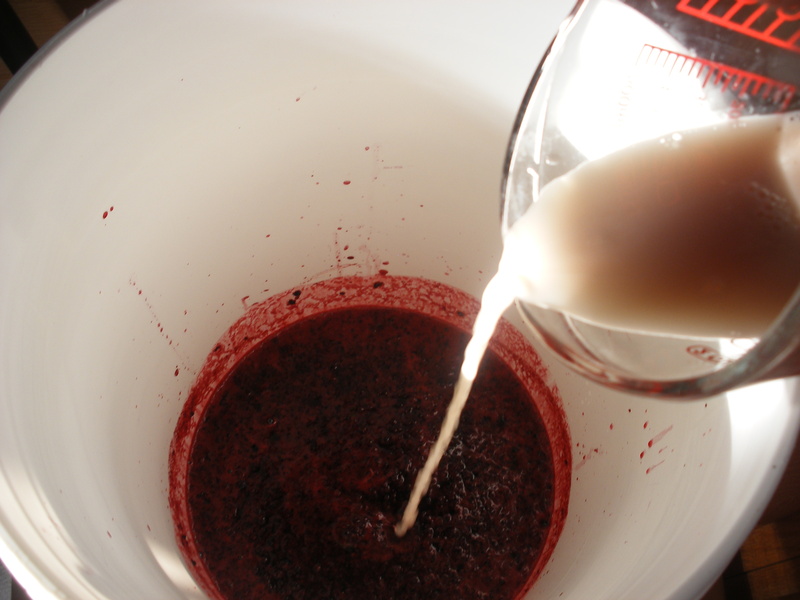 B&G guys recommended Lalvin K1-V1116 to produce a medium sweet, fruity wine. 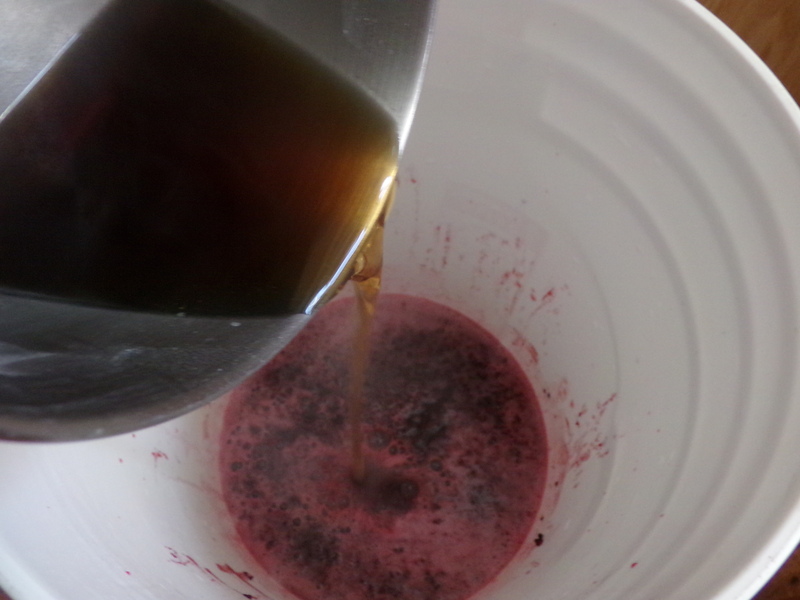 Adding the “cooled” syrup (relatively- it was 95 and humid today), then I stirred to dissipate any lingering heat. I’ve killed yeast before. Never again. 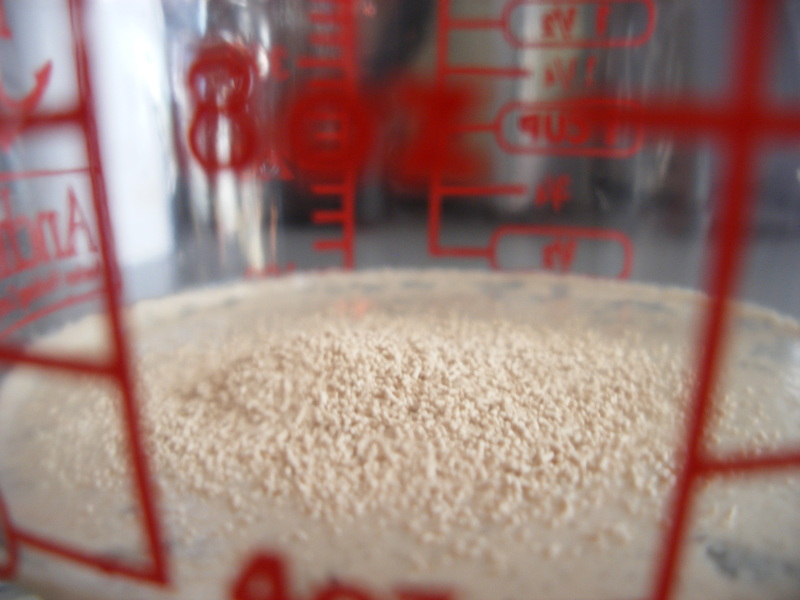 I bake bread fairly frequently- any yeast is supposed to look like this when it’s ready. Covered with a thin, clean kitchen towel, and it’s now camped out in a spare room where the dogs can’t reach. Per that recipe, it will begin fermentation on the pulp. It will sit like this, lightly covered, for a week. I’ll be keeping a close eye on it, and conducting frequent sniff tests. With how warm it is today, and the heat forecast for the rest of the week, I would not be at all surprised if it was good to go a bit early. No sense in letting the yeast eat themselves to death before I even strain it. 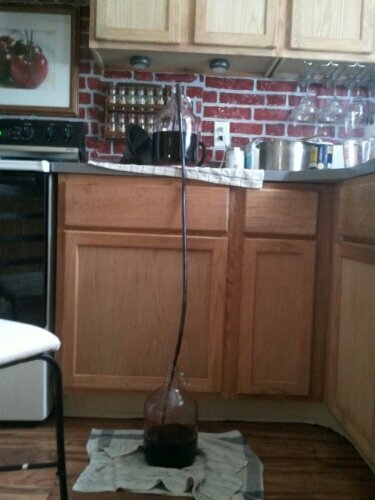 So, next week, I’ll strain it through those muslin bags, and put the liquid in the glass carboy(s). 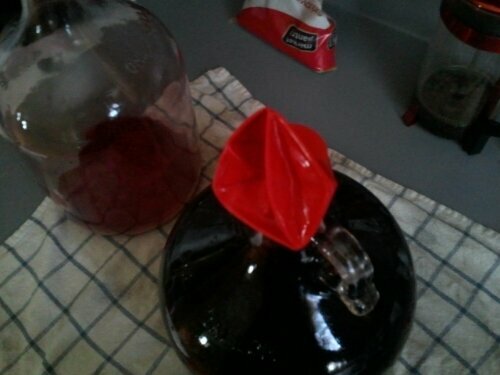 I discovered I am also short one airlock, so to monitor fermentation, I’ll use a trusty balloon on the mouth of the jug. 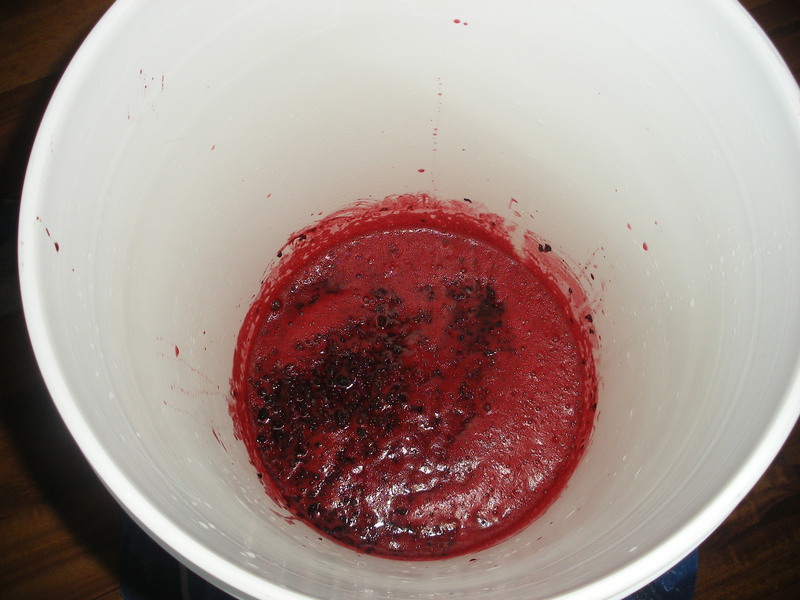 After that I hope to carbonate it, because I love fizz and fizzy blackberry wine sounds real, real good. Poured over ice. 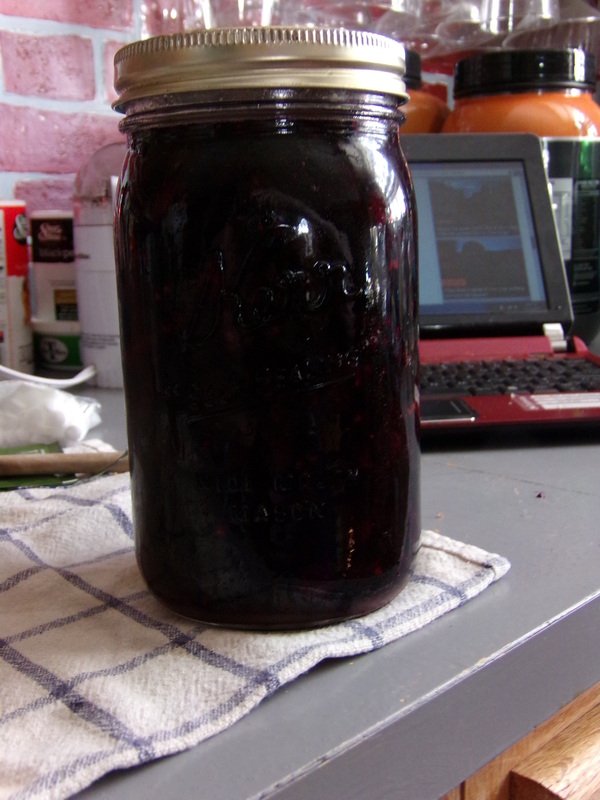 To top it all off, I was left with a little over a pound of blackberries! That means pie and cobbler once it drops back below 90 and I can bear to have the oven on. Where did I get all those berries? Glad you asked! Look over here. Props also go to this site, which seems to have sadly fallen out of use.